On 29th May 2017, we introduced a feedback form asking a Yes/No question: “Did you find this useful?” and a follow up text question “Can you tell us anything more?”. We only showed the feedback form in situations where we could provide the user with some data. We have implicitly assumed that in cases where we showed the “We don’t have data for your area” page and provided contact details for the user’s council, this was not helpful and didn’t ask for feedback. The way to fix/improve that is to have greater coverage. We also only showed users a feedback form on our own website - it wasn’t shown to embedded users and we don’t have any data about users consuming our data on third party websites via the API. It is important to understand what people liked and found useful so we can keep doing it, and also why people found it unhelpful and what we can do to improve. To drill down into this, we will examine some text comments in greater detail. These are lovely and it is nice to get so many of them, but they’re not directly actionable. Super-easy to use, it took me less than 20 seconds to find out where I should vote. Very clear and well designed website. Easy to use and all the info I wanted on one page! All the information clearly on one page thank you! This was a very quick and precise answer to my question. Well Done! Would be good to include when it shuts. It should tell the time that the station opens and closes. Would like opening times to be more prominent. All I really wanted to know was the time polling opened but there is it on the right hand side. Thank you. Directions are perfect too. This is an excellent little tool. Well done. I actually wanted to check when the polls are open until, but that was clearly stated on the right (and of course I guess the opening times are the same for everyone). So thank you! While the opening hours are at the top of the page in desktop layout, on mobile devices, that information ‘collapses’ and is displayed lower down the page. The vast majority of users on Where Do I Vote were using mobile devices (74% over the study period, rising to 79% on polling day itself). Note that 2 of the people who did find the opening hours useful reference this info being “on the right” (i.e: they were using the desktop layout). Make the opening times really obvious - this is an important piece of information and people expect it to be prominently displayed. Any future design work on Where Do I Vote must adopt a mobile-first approach (rather than a desktop-optimised site that “collapses” on mobile) assuming that the majority of our user base will be using mobile devices. Again, it is worth making this information more prominent but it should clearly be much lower down in the information hierarchy than opening hours based on these comments. There is another polling station closer to me but I was told I couldn’t vote there. I live nearer to David Livingstone school which is being used as a polling station, why can’t I vote there? Do I have to vote only from one polling station? We currently don’t explain this anywhere, but we should add some copy to the site to make this point more obvious. We received a lot of feedback about mapping and directions. For a website which is trying to answer the question “where…” this is clearly going to be an important topic. Very clear directions, well done!!! I think the map feature is brilliant. Such an easy tool to use. Thank you for the help and the map. SO GOOD!! Map quality very good and adding the directions was most helpful. Maybe a map? But still good! A common reason for people to leave negative feedback about mapping/directions was that the directions lines didn’t follow the roads exactly (particularly if the roads are curved). In these examples, the maps the comments relate to are shown with the comments to provide context. 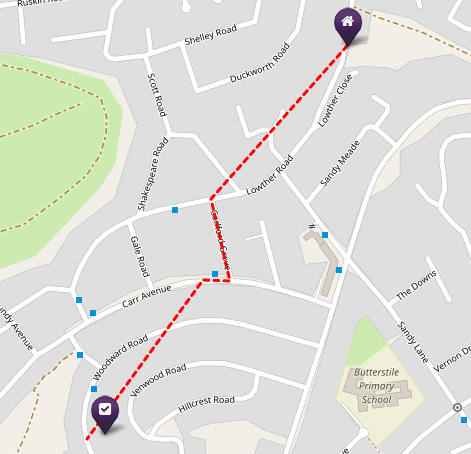 This “suggested” route is awful, am I expected to fly or crawl over gardens to get there? In general, providing directions is useful more frequently than it is not useful but we need to take a more sophisticated approach to the way we represent directions to ensure that the directions provided are of a high quality. We have also run into usage limits with the google directions API which prevented us from being able to serve directions to some users. We should evaluate alternative providers to see if we can find a better solution. It is clear that this is a valuable feature for users. Another of the most common reasons for people to leave negative feedback about mapping was because the polling station was correct and we were showing a polling station point based on a (correct) postcode centroid but that point we were showing was down the road or round the corner from the actual polling station building. 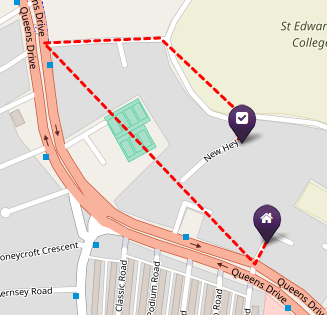 It helped me confirm where I need to go but the map is slightly incorrect as the entrance to the school is on Regent Road. Polling station isn’t quite in the right place. It’s actually in the church 100m east of the marked location. The pointer is a little misleading. Our polling office is at Mountpleasant Primary School. People would probably find it the end if they didn’t know where it was but may have to walk up and down the entire street to spot it. Wrong end of the street! The location of the station is wrong. It is about a two minute walk north of there, along Pinner Hill Road, opposite Latimer Gardens. What a terrible piece of information, given the magnitude of the election. 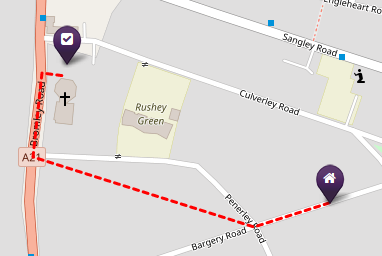 The polling station is NOT in Gloucester Rd but on Brynland Avenue. This is a significant error and may have put people off. Highly inaccurate! This map shows the Polling Station to be at Skipton Auction Market not the swimming pool. It’s a good job that I already know where to go as this load of rubbish would have sent me on a wild goose chase. This was quite a common cause of negative comments and we did update the site with more accurate grid references throughout the day in many cases where we received complaints. People clearly want maps when we don’t provide them but also expect a higher level of accuracy than we can sometimes realistically achieve with the supplied data. There is scope to deliver additional value here by exploring whether we can crowdsource more accurate points in cases where we do not have exact grid references or UPRNs. Investigate other solutions for a directions API - can we find an alternative to google directions which does not have the same usage restrictions? Aim to develop tools allowing us to crowdsource more accurate station points where we do not have exact grid references or UPRNs. Is there scope for us to work with or learn from existing online mapping volunteers (e.g. the OpenStreetMap community) on this? Another strong theme of negative comments was people using the form to report problems or incorrect information. This is the worst and most worrying class of negative comment. That’s wrong - I got there and the building is closed, no signage re it being a polling station. Correct place seems to be Bute Town Community Centre, about a mile away. Now run out of time to vote before work. The map sends you to West Bletchley, 30min walk away. Chepstow Community Centre is less than 5 mins walk away. The pin on the map doesn’t match the address. Our voting station was changed due to the hall not being available. You are feeding the wrong information to people. the map location shown was incorrect, by quite a long way. 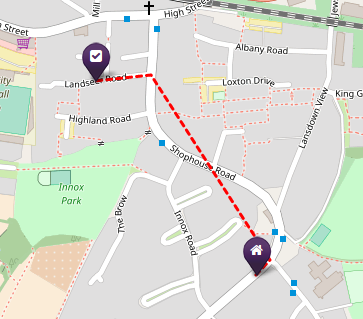 SM5 4NP is not on Wrythe Lane as shown but on Nightingale Road, the other side of both Carshalton and Carshalton Beeches stations. It is difficult to generalise about these comments because each comment addresses a very specific problem and required its own individual follow-up and solution. Given the volume of data we are dealing with (and the speed with which we have to collate it) it is unrealistic to achieve a 0% error rate but we do need robust procedures to prevent and follow up errors. It is more useful to talk about improvements we can make to reduce errors and improve the process of following up on them rather than address the specific nature of individual reported problems here. As noted, we received a large number of error reports through the medium of people leaving negative feedback. One fairly time-consuming part of the process was sorting through a large volume of text comments to find bug reports. We should add a dedicated “report a problem” button to reduce that triage overhead. This form should also request an email address for follow-up. Although with 2 people working on it all day we were able to deal with a lot of problems, there was more than 2 people’s worth of work to do. For the council election next year, 2 may be sufficient. For the next General Election we should try to allocate additional capacity to this task. Given this is a time-bound and well-defined task, we may be able to find a volunteer to help with this. We need to put more effort into making sure we have direct contacts at councils on polling day so we can follow up problems more easily. In particular, there are a number of authorities where we use published data but have no contacts and this was a problem. Although our data checking processes are fairly robust, there is scope to reduce our error rate by implementing more automated checks on the data at import time. I didn’t receive a polling card, so this was invaluable. I misplaced my poll card so this was extremely useful. Haven’t received my polling card from council. Useful resource. Couldn’t be clearer! Very helpful for a first-time voter in this constituency (have just moved here). new to area … 1st time voting here … so thanks. I’m new to the area so this feature is heavily useful, it’s also about 5 minutes walk away which is fantastic! Great tool. New to the area and lost my polling card so didn’t know where to go. Thanks, I lost my poll card and couldn’t remember the address as I only moved last year. Gave me the information I needed right away with a map. And also had helpful related info on the site, including answering a question I had because my polling card hasn’t arrived yet. Very simple to use and the extra information about whether one needs ID or polling card is helpful. quick and easy, straight from google and confirmed that I didn’t need the poll card. Thank you. I didn’t know you don’t need your polling card to vote! I was worried I won’t be able to vote without a poll card. But it’s good to know that I don’t need it to register my vote! Thank you, this site is so helpful and clear, it so easy and informative especially for a first timer! lovely quick and easy better than local council one! no other site provided this info for Potton! so thank you! I don’t understand how all the other websites were difficult to navigate to get this info, but thank you for making this simple here. Quick easier service than phoning the council. Would been nicer to be aware of this before. moving with the times. Things like this need to be the first thing to go to rather than call in. My local council does not recognize my postcode. This has saved my vote!!! The information most important to users relates to the practicalities of voting (e.g: opening hours, do I need my poll card). A much smaller number of people commented that they want information on their candidates (which would imply more considered research is taking place). The majority of our users were using mobile devices (74% over the study period, rising to 79% on polling day itself). Many people may be using the site while ‘on the move’. 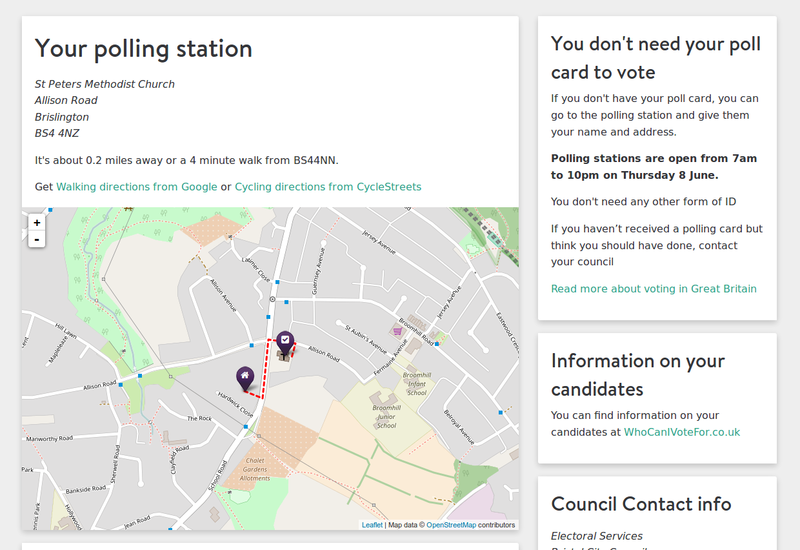 Where Do I Vote gets the vast majority of all traffic on polling day and the night before. The average session duration is just 53 seconds. Having walked to the place where I have previously voted - only to find it shut - I felt somewhat at a loss as to where to go. Until I accessed this site. underline that users expect their interaction with the site to be rapid and focussed. I suffer from Vascular Dementia and lost my polling card although I am registered I have forgotten the details. This information has been invaluable. Thank-you so much. Very clear, simple, comprehensive. It’s a wonderful voting tool and it definitely influenced positively my decision to vote. Thank you for providing such informative and easy-to-follow pre-voting platform.